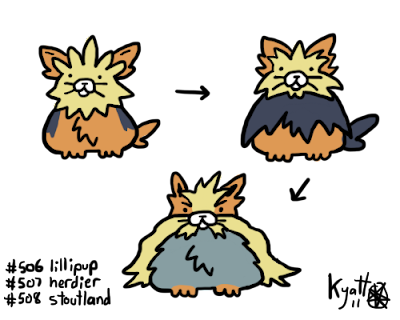 Lillipup has the dubious honor of being this generation's Pokémon that people thought was going to be the new baby form of an existing Pokémon. Speaking of which, why the hell did some people think that Kecleon was going to be related to Lickitung, beyond the fact that they both have long tongues? If I recall correctly it's because we were 13. Wait, People Below The Ages Of 20 Play Pokemon Still? Wow. I saw Lillipup and was all "Aw, it's cute!" Then I saw Herdier and was like "Hey, it's cool!" Then I saw Stoutland and "... oh."